Are you a violin enthusiast? If so, you can’t miss this fabulous violin. This ASTONVILLA 4/4 AV01 Acoustic Maple Wood Violin with Imitated Ebony Accessories / String / Shoulder Rests / Tuner is completely handcrafted. It features classic coffee color as well as a set of solid strings. 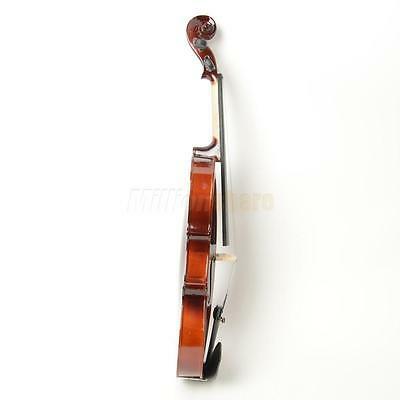 The strings are made of high quality material and thus make decent sounds. 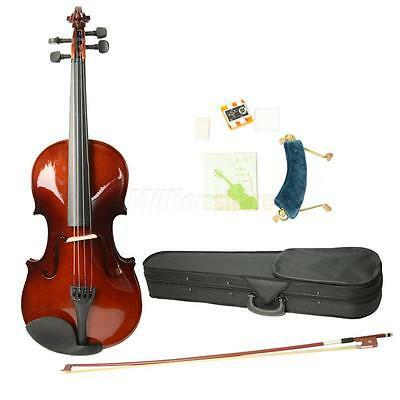 With various accessories included in the package, it is also suitable for beginning student violinist. Don’t hesitate to get one! 1. Ship worldwide from New Jersey by reliable shipping companies — USPS, UPS, FEDEX, DHL, etc. and only to VERIFIED PAYPAL ADDRESS. Transport Delivery ETA. 3. Package handling only takes 1 business days at our warehouse, so please make sure entering correct payment and shipping information before checking out. Once your payment is completed, we are not going to accept any more changes to your order. 4. Please check your shipping address carefully before checkout, it can’t be changed if order completed. 5. Orders placed will be shipped within two business days, placed on weekend will be shipped within 2 days. Notification of shipment with tracking number will be sent to buyers. 7. Ship within 1 business day once payment completed. Notification of shipment with tracking No. will be sent to buyer. 8. We offer discounts for combine shipping. Please contact us first if you need combine shipping, and an invoice with discount will be sent to you. 9. Please allow 5 business days for delivery to US destinations on any eBay orders and 14 business days for delivery to any International destinations. We highly recommend our buyer choose priority/expess mail for international delivery which is much more stable. 2. NOTE: Payment should be sent within 8 (Eight) days of auction closing. Or unpaid dispute will be filed for closing auction. Please contact us if you have any questions of payment procedures. 1. Refunds given only if item DOA and cannot be replaced via PAYPAL . If so, Please reported within 5 days and return to us within 30 days from the delivery date for exchange or refund. PLS DO NOTE WE ARE NOT RESPONSIBLE IF PROBLEM EXCEED OF THIS TIME LIMITE. 2. Buyer should check the package once receiving. If the package damage during the freight, please refuse to sign for the package and it will return to us. Then contact us promptly. 7. All NON-seller mistake returns for refund are subject to 20% re-stocking fee and buyer should pay for the return shipping fee. (E.g. you bought wrong model or wrong color). 1. If you don’t get response within 1-2 business days, pls check your My Messages in case your email provider has an overly-aggressive spam filterblocking eBay’s emails. Please email us AGAIN. 2. Email is the priority of our customer service. A: The item will be shipped within 1-2 business day once payment completed. CLEARANCE SALE — Up to 10% off, Over 200 items maximum $10. Inventory ranging from people. Rush to buy ! Copyright © 2016 Millionshare. All rights reserved.